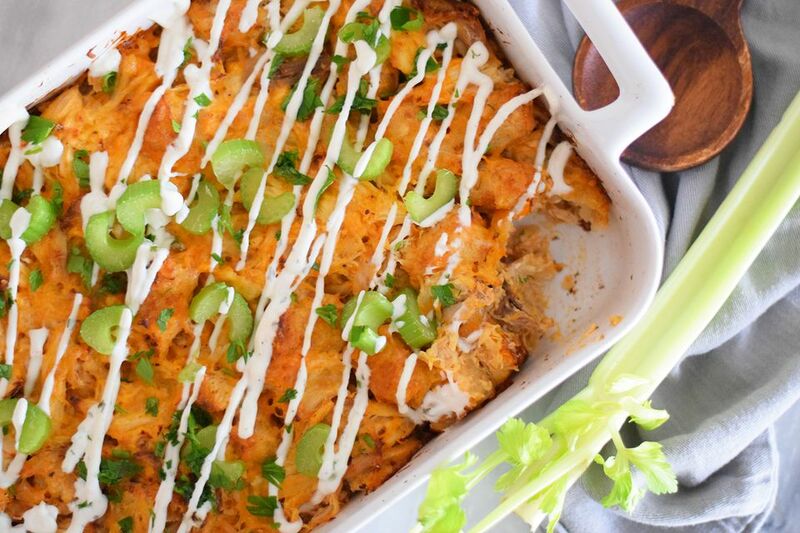 Nothing beats a big pile of wings during a football game, but this delicious casserole comes pretty close and it's the perfect way to satisfy those spicy cravings. It's packed with all of that amazing Buffalo wing flavor without the deep frying or messy fingers—a wonderful way to serve up your favorite app and call it dinner! The great thing about this recipe is its versatility. It's easy to give this casserole a paleo-friendly spin—just sub in cauliflower rice for the tater tots. You can also swap in regular potatoes or sweet potatoes, depending on what you have on hand, or sneak in some cooked chopped spinach to amp up the health factor. The Buffalo chicken casserole is insanely easy to whip together, especially if you buy a pre-cooked rotisserie chicken and shred it up quickly at home. The ingredients are all easy to find and the tray bakes up in no time at all. It's great as a complete meal that pleases the whole family, or you can use it as a side. It's even good as dip for chips or a spread for veggies. Add the cooked chicken, sour cream, wing sauce, chicken soup, pepper jack cheese, and frozen tater tots to a large bowl. Stir the ingredients gently to completely combine. Make sure the sauce and sour cream is evenly distributed. Use a spatula to help combine the ingredients. Add a the teaspoon of salt and pepper. Spray a 9x13-inch casserole dish with non-stick cooking spray. Pour the mixture into the casserole dish and spread it evenly into the dish. Top with more shredded cheese if you wish. Place in the oven and bake for 25 to 30 minutes or until slightly browned and bubbly. Top with ranch dressing, chopped celery, and chopped parsley if you wish. This is a great way to use up homemade chicken that you baked or made in the Instant Pot. Shred up the bird yourself and use it for this recipe. You'll have plenty leftovers to top on a salad or add to a soup. You can add more or less Buffalo wing sauce depending on how spicy you like your food. The sauce is what gives most of the flavor to the recipe. Make the casserole low-carb by replacing the tater tots with a 32 ounce bag of frozen cauliflower rice. It is a nice way to sneak in a ton of veggies and fits into a paleo diet. If you want the dish to be a little less spicy, you can use cheddar cheese instead of pepper jack. Any slightly firm shredded cheese will yield the same results. You can also top the casserole with sliced scallions.